Lakeside gardens, model boats and fine dining overlooking the nation's monuments could one day redefine a site on the National Mall that has languished for years with fetid water, dying fish and crumbling walkways. 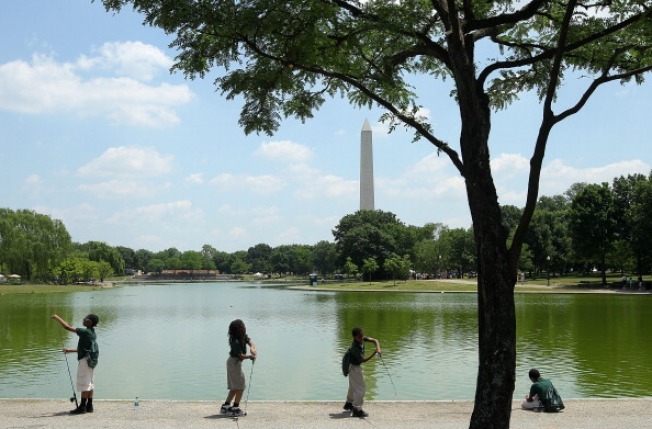 After holding a design competition to improve spaces on the mall in 2011, the nonprofit Trust for the National Mall selected the little-known Constitution Gardens for a major rehabilitation over the next five years, officials with the group told The Associated Press. Designers are still refining the concept but are developing an ambitious project whose budget totals about $150 million. What is now an algae-filled 3-foot-deep concrete tub of water that gets so hot that fish die each year would be re-engineered as a natural lake up to 12 feet deep, surrounded by vegetation and walking paths. A shallow water ring on one end could be versatile for activities including boating and ice skating. Designers say such plans will reactive a spot between the Washington Monument and Lincoln Memorial that's been forgotten in recent decades, even though it's part of the most-visited national park. Organizers imagine it could become more like the waterside respites of New York's Central Park. The project was prioritized over building a grassy new amphitheater and pavilions near the Washington Monument. "With Constitution Gardens, obviously the need is just so great that there was no denying we needed to try and get this one built as soon as we could," said Teresa Durkin, the project director. "People need a place to decompress" after visiting Washington's museums and monuments, she said, "and have a little fun and be in a beautiful place." On Thursday, the U.S. Commission of Fine Arts, one of two federal panels that must approve projects on the National Mall, voted to approve the initial garden concept. Commissioners said they would like to see the work completed as soon as possible. Interior Secretary Sally Jewell touted the project at a summer fundraising luncheon and said the project can't be completed without private support due to federal budget constraints. Md. Teacher Wins $1M on "Wheel of Fortune"
"To give it the kind of lift that it needs is going to require private philanthropy," she told the AP. "We need a pond where the fish don't die every year." Unlike most national park projects, construction will be privately funded through a major fundraising campaign. The project will be managed by the nonprofit group then handed over to the National Park Service. The gardens were originally dedicated in 1976 to mark the nation's bicentennial. A small memorial was added later to honor the 56 signers of the Declaration of Independence. In the past 20 years, though, the garden has fallen into disrepair. Landscape architects who have studied the site call it dysfunctional. Beyond the pool where fish can't survive, walkways are crumbling and the soil is so poor that trees planted less than 40 years ago are already stunted or suffering. This end of the National Mall, including the Lincoln Memorial, was once under the Potomac River. In the late 1800s, landfill soil was dredged from the river and mixed with construction rubble to extend the park. The project would be built in two phases. By 2016, the group aims to complete an entry plaza, garden wall, event plaza and rehabilitation of a historic lockkeeper's house on the edge of the park to serve as an exhibit center. That would allow time to raise money to rebuild the lake and gardens with remixed soil and add a pavilion with a restaurant, observation deck and concessions by 2018 or 2019. Revenue from food sales and other activities could fund the park's maintenance. "There isn't anything like that on the National Mall right now," Durkin said. "Wouldn't it be divine to be able to sit here with the lake in front of you at night, lit up, and the Washington Monument behind you? It's absolutely beautiful."